Give Your Tenants A Lift! 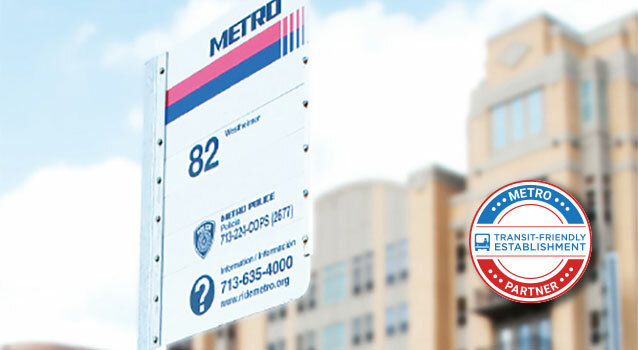 Experience convenient, transit-friendly living with METRO. METRO’s Smart Apartment Partner Program is a partnership between apartment managers/owners, tenants and METRO. The program is designed to enhance the quality of life for people living in apartment communities located adjacent to accessible METRO services. Property must be located one-half mile or less from a bus / rail line. METRO service must be easily accessible. Frequency of METRO service must be every 20 minutes or less. Research indicates that millennials and single individuals are more likely to use public transportation than other groups. According to the National Multifamily Housing Council, (NMHC), 30 percent of all apartment renters are under the age of 30 – that’s approximately one-third of your business. Now, you have the power to offer this demographic the extra amenity other properties cannot! Set yourself apart from other properties. Adds an innovative marketing selling point. Creates a perk for residents at no cost to you. FREE use of the METRO Smart Apartment Partner Program logo in advertising, publications, and signage. FREE listing in METRO’s directory of certified properties. FREE METRO Q® Fare Cards with $5 value for new resident welcome packets. Convenient access to full fare METRO Fare Cards. Receive Rider Rewards discounts at participating businesses. Receive a Smart Apartment Partner Certification decal. METRO makes becoming a partner easy. The program is FREE and only takes a few days to get started. Book an on-site meeting with property management. Schedule how-to-ride training session(s) for property management and staff. Identify additional activities to educate residents on METRO services. Publicize and partner with METRO Q® Fare Card to conduct on-site registration events for residents. Publicize and partner with METRO on How-to-Ride training for residents. Include METRO information in new resident welcome packets (local bus routes, METRO Q® Fare Card information) and on your website. Participate in METRO’s Adopt-a-Stop / Adopt-a-Shelter program. METRO will monitor and follow-up with Partner properties to review progress, need for re-training, and restock or make changes to marketing materials. At the end of year one, METRO will conduct a survey to analyze the program’s impact, make necessary adjustments and recertify the property. Learn more about the METRO Smart Apartment Partner Program by contacting Client.Services@ridemetro.org or call 713-739-4015.